"Your Survival is Our Business." At Lifeline Inflatable Services Inc. we only sell quality products because we understand the importance of having dependable safety equipment on board. 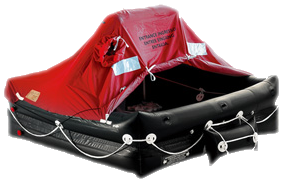 We can help you decide on the right liferaft whether it be a coastal, offshore, USCG approved liferaft in a valise or in a container. We appreciate every customer and it is our guarantee that we will take the time at your purchase to educate you on the deployment procedures and the equipment pack of your new liferaft. At Lifeline we will serve you with the ultimate support you deserve, thats our promise. Lifeline Inflatable Services liferaft facility has been approved by the U.S. Coast Guard, DNV (Det Norske Veritas) and each liferaft manufacturer we represent. Lifeline is also a member of the United States Marine Safety Association. Our liferaft technicians are factory-trained and certified for 4 to 100-person liferafts, leisure, throw over and davit-launchable commercial liferafts, as well as inflatable buoyant apparatus, self-righting liferafts and marine evacuation slides. At Lifeline Inflatable Services we are serious about survival equipment. With more families boating these days and cruising further, they are understandably becoming more safety-conscious. This means being prepared with liferafts and EPIRBs in case the unthinkable happens. We at Lifeline encourage you to visit our liferaft facilities to see your liferaft open at your service intervals. Our factory-trained technicians will explain the deployment procedure of your liferaft, go over its components, and review with you your equipment pack, then answer any questions you may have. We highly recommend such a visit to all cruisers: single handed, couples, families, as well as captain and crew members of mega yachts. Let the first time you learn how to use your liferaft be on land and not in an emergency!